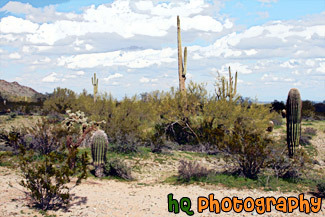 A scenic picture taken of an Arizona landscape scene with lots of cacti and puffy clouds in the sky. 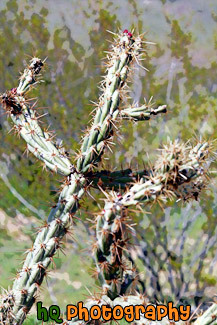 This photo was taken in the desert at San Tan Mountain Regional Park. 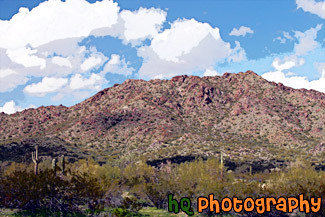 A scenic picture taken of an Arizona landscape located at the San Tan Mountain Regional Park. The mountain can been seen in the background behind some cacti trees. Partly cloudy sky is above. 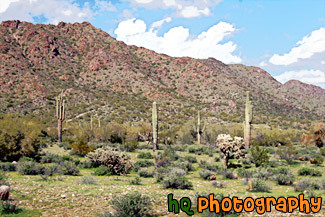 A scenic picture taken of the Arizona desert landscape seen at San Tan Mountain Regional Park. You can see some puffy clouds above the mountain and some cacti trees in the foreground. 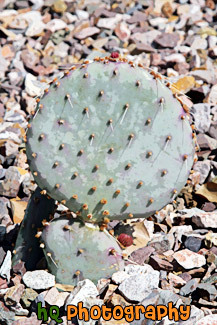 A scenic close up vertical picture taken of a baby prickly pear cactus plant located outside of a homeowner's yard in Arizona. Small rocks surround the cactus plant. A scenic vertical picture taken of some cacti plants close up. These cacti were found on the San Tan Mountain Regional Park Goldmine trail in Arizona State. 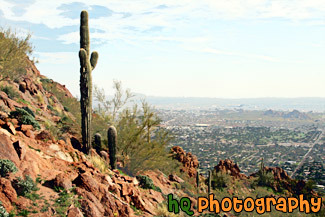 A scenic picture taken of a pretty view from the hike on Camelback Mountain near Phoenix, Arizona. You can see a cactus tree in the foreground. 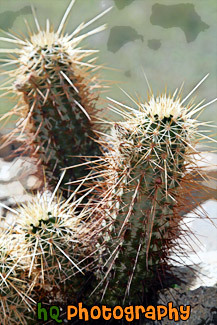 A scenic vertical picture taken of a cactus plant up close with a couple red or maroon flowers seen at the top. 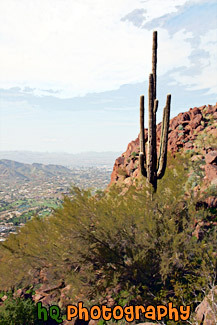 A scenic vertical picture taken of a Camelback Mountain view and a cactus tree in the foreground in Arizona State. 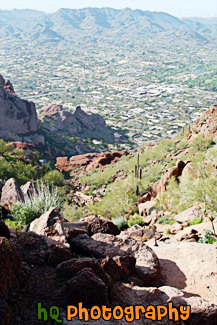 A scenic vertical picture taken of a trail and hills of camelback mountain located in Arizona State near Scottsdale and Phoenix. 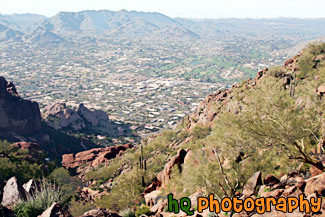 A scenic picture taken of the view looking down from almost the top of Camelback Mountain located near Phoenix, Arizona. 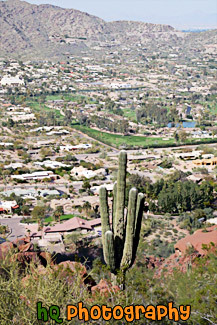 A scenic vertical picture taken of a view from the lower part of hiking Camelback Mountain in Arizona and a cactus tree and Scottsdale. 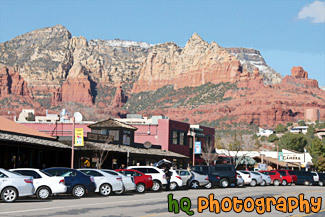 A scenic picture taken of the downtown Sedona area in Arizona with red rocks seen in the background. This photo was taken on a sunny day with blue sky seen in the background. People are out on the streets enjoying the downtown. 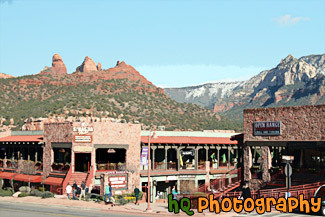 A scenic picture taken of the downtown area of Sedona, which is located in Arizona State. 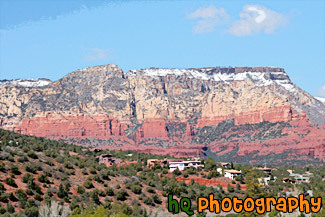 The famous red rock of Sedona is seen in the backround which surrounds the entire city of Sedona. Blue sky is seen in the background too. A scenic picture taken close up of the Montezuma Castle National Monument located in Arizona State. 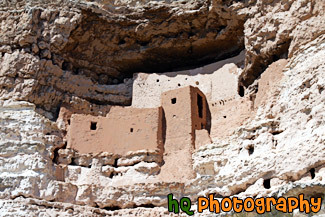 This castle is one of the best preserved cliff dwellings in North America. This castle has 20 rooms, nestled into a towering limestone cliff and tells a 1,000 year-old story of ingenuity and survival in an unforgiving desert landscape. Montezuma Castle was established as a National Monument in 1906. It was home to the prehistoric Sinagua Indians. 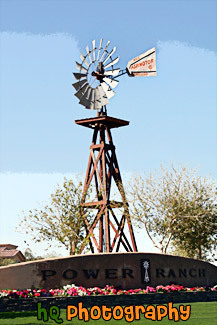 A scenic vertical picture taken of the Power Ranch Windmill located in Gilbert, Arizona. Power Ranch is a housing community that offers comfort, family lifestyle living, and an abundance of large scale amenities. 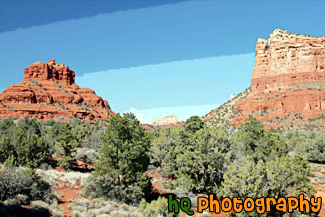 A scenic picture taken of some of the Red Rock hills seen in Sedona Arizona State. This photo was taken with blue sky seen in the background. The rocks surrounding Sedona are red because of iron. Sandstone is porous, and when water carrying dissolved iron drains through the sandstone, some of the iron is left behind, and it is this iron in the form of iron oxide, which is red, that coats the grains of quartz and gives it color. 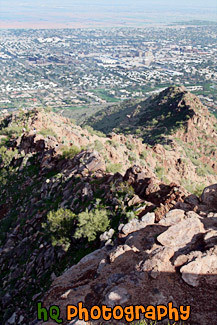 A scenic vertical picture taken looking down on the trail at Camelback Mountain in Arizona State. You can see hills in the distance and the big rocks on the trail that you have to climb over. 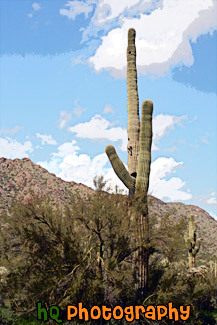 A scenic vertical picture taken of a tall Saguaro cactus tree located in the San Tan Mountain Regional Park in Arizona. The photo was taken on a partly cloudy day. 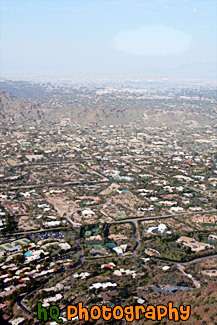 A scenic vertical picture taken of a view of the city of Scottsdale, Arizona from on top of Camelback Mountain. 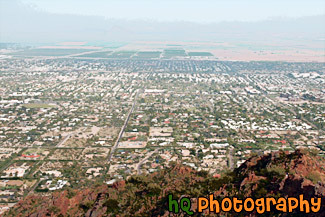 A scenic picture taken of the view of Scottsdale, Arizona from the top of Camelback Mountain which is near Phoenix, Arizona. A scenic picture taken in Sedona, Arizona of the red rock hills and some houses on a hill. Some snow is visible on top of the red rock hill. 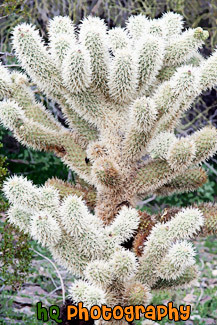 A scenic vertical picture taken of a small cactus tree that is white and green in color. This picture was taken in Arizona State.